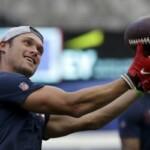 CHARLOTTE, N.C. — The Carolina Panthers have signed former New England Patriots wide receiver Chris Hogan to a one-year contract, the team announced Friday. Hogan, who won two Super Bowls in three seasons with the Patriots, was undrafted out of Monmouth University in 2011. He played one collegiate season at Monmouth after playing four years of lacrosse at Penn State. The 6-foot-1, 210 pound receiver has 194 catches for 2,610 yards and 18 touchdowns for his career. In 2016, Hogan tied DeSean Jackson for the league lead with 17.9 yards per reception. 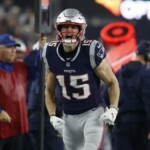 Since 2016, Hogan is tied for first with four receiving touchdowns and is second in the NFL with 542 postseason receiving yards. Prior to joining the Patriots in 2016, Hogan was a member of the Buffalo Bills from 2013-2015. He was originally signed by San Francisco in 2011 and spent time on the practice squad for the New York Giants and Miami Dolphins.